The premise of Seth Grahame-Smith’s bestselling novel, Abraham Lincoln Vampire Hunter, is awesome. Somehow though, I never got around to reading it. So when the movie came out, I had to see it. It was obvious from the trailers that the story was anything but a joke. Still, I couldn’t fathom how — given everything we know about our 16th President — the history could be believable. OK, so you have to buy into the whole Vampire’s-are-real thing. 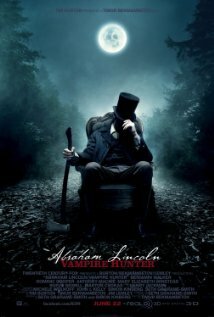 But after that … Abraham Lincoln Vampire Hunter is disturbingly plausible. Which got me to thinking … What if? What if … what we’ve been taught about that time in history is only part of the truth? The possibility is awesome. 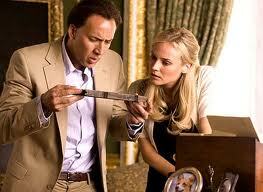 National Treasure is a perfect example … A secret from our nation’s past leads to the greatest adventure (and treasure) in history. Benjamin Gates’ (Nicolas Cage) life-long journey leads him, and his nerd-savante sidekick Riley Poole (Justin Bartha), to an invisible map that is encrypted on the back of the Declaration of Independence. However, what they thought was the final clue turns out to only be the beginning of their hunt. Gates soon realizes that to protect the world’s greatest treasure, he must steal the most revered, best guarded document in American history before it falls into the wrong hands. In a race against time, Gates must stay one step ahead of his ruthless adversary (Sean Bean), elude the authorities, and unlock a 2000 year-old mystery behind our greatest national treasure. What makes this story so believable are the historical facts that are woven into the story at every turn. Nine of the Founding Fathers who signed the Declaration of Independence were Masons. The invisible map (encrypted using Masonic symbols) points to the hiding place of King Solomon’s treasure — an unfathomable storehouse of wealth — that vanished after the Knights Templar (precursors to the Masons) uncovered it beneath King Solomon’s palace. And let’s not forget the clue Gates discovers on the Independence Hall clock tower on the back of a hundred-dollar bill, or the special glasses needed to read the map — made by Benjamin Franklin himself, the inventor of bifocals — that are hidden in that very clock tower. And the final believability gem (pun intended) comes when Gates realizes the treasure is deep beneath Trinity Church (Trinity Wall Street at 79th Street in Lower Manhattan), which was founded in 1696. Again, the magic of … what if? This time Benjamin Gates sets out to discover the truth behind the assassination of Abraham Lincoln, by uncovering the mystery within the 18 pages missing from assassin John Wilkes Booth’s diary. A Gates ancestor has been accused of being an accomplice in Booth’s crime, and Benjamin believes the missing pages will clear the family name. His conviction drives him to uncover clues to the location of the mythical City of Gold, Cibola. The historic facts laced throughout this story are viable. Such as the hidden inscription on the scale model of the Statue of Liberty on the Île aux Cygnes in Paris that points to the two Resolute desks; one of which is in the Queen’s chambers in Buckingham Palace, the other in the Oval Office of the White House. All well and good. 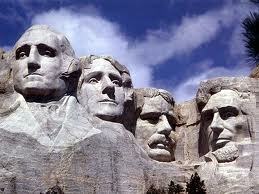 But they lost me with the Mayan-style temple of gold beneath Mount Rushmore. It might just be me. But the only way I’d believe that one is if they proved George Washington used his hatchet to cut crop circles to signal aliens (instead of chopping down that cherry tree). Because the aliens could totally have helped the Mayans build a temple of gold beneath Mount Rushmore. Which of course, is why George’s face is now on that mountain. But seriously … a city carved into the walls at the bottom of the Grand Canyon — similar to Petra in Jordan — and filled with tons of golden artifacts would have been much more believable. I’m just sayin’. Are you listening, Jon Turteltaub? 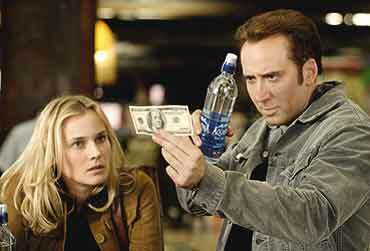 I’m hoping National Treasure 3 — if and when it happens — brings the series back on track to its original suspense filled, believable glory. Without aliens, crystal skulls, or nuked refrigerators. Please! What I learned from these stories was … to keep a story believable the audience needs a consistent trail of plausibility that’s easy to follow. A logical set up of known historical facts woven throughout the story so they pay off in a believable secret history. Let’s face it. On some level we all want to believe the secret history could be true. We want to believe, because it takes us out of our day-to-day lives and lifts us up into realm of infinite possibilities. That … What if? … place, where anything can happen. A storyteller’s mistake comes when their plausibility trail hits a wall that requires us to pole vault over it. The end result … you lose us … an audience that wanted to go along for the ride, not go out for the Olympics. What’s your favorite piece of secret history … American or otherwise?